How do anti-Israel activists manufacture fake “scandals” about the Jewish state’s latest alleged misdeeds? 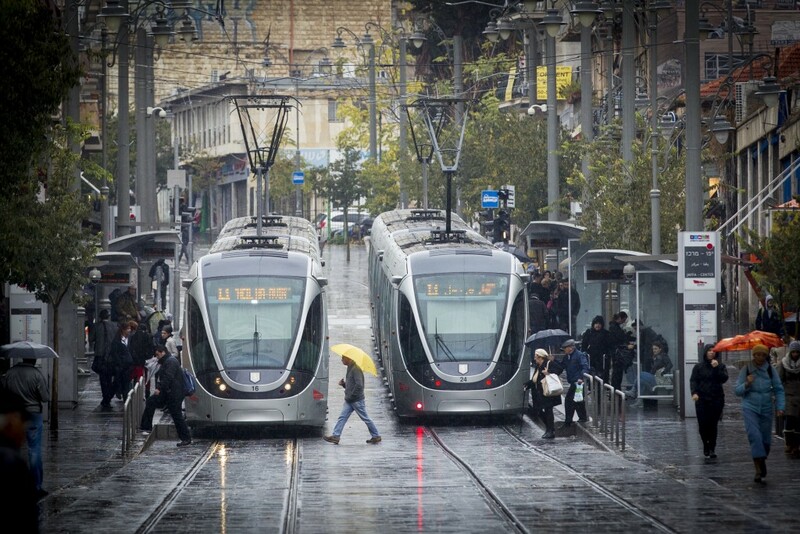 The strange case of the Jerusalem light rail system offers a perfect example. The Jerusalem light rail has only one line, and services 150,000 people each day as it snakes from Mount Herzl to the East Jerusalem neighborhood of Pisgat Ze’ev, traversing some the world’s most disputed real estate. Perhaps as a result, it was dogged by controversy from its inception. International NGOs attacked the transportation project, painting a highly negative image of the project that managed to make it on to such media outlets as the BBC. How did this happen? The answer matters because it suggests a model for how the Jewish state’s opponents succeed in spinning Israeli behavior, however benign, into the bad publicity that feeds delegimization campaigns in the West. In 1996, the newly-elected Likud government authorized the most ambitious public works project in Israel’s history, appropriating $300 million to develop Jerusalem’s transportation network. The pièce de résistance of the program was the Jerusalem light rail, an 8.6-mile-long track enabling fast transit through the city center and between pre- and post-1967 Jerusalem. The Israeli government commissioned the Seattle-based firm CityPass to design and construct the light rail, offering the company a 30-year concession as compensation. Clocking in at a cost of 3.8 billion NIS (around $1 billion), work on the light rail began in 2002 and finished at the end of 2012. The point of the light rail was to reduce congestion and improve the lives of Jews living in eastern Jerusalem. Anyone who’s taken the light rail knows that it makes multiple stops in Shu’afat and Beit Hannin, and that plenty of Palestinians ride it. Eighty percent of eastern Jerusalem Arabs live in poverty, and it can’t be an inconvenience to vehicle-less Palestinians for an inexpensive train to pass through their neighborhood. Indeed, the absolute worst harm that the Electronic Intifada—the boycott-Israel journal of record— could pin on the light rail was that it causes a Palestinian traffic light to stay green for only 10 seconds. So if you guessed that the actual Palestinians of Jerusalem didn’t protest the project too hard, you were right. But the absence of grassroots Palestinian opposition to the light rail didn’t stop their advocates in the West from complaining on their behalf. Adri Nieuwhof, a Dutch anti-Israel journalist and activist, wrote that the light rail was a ploy to tighten Israel’s grip on eastern Jerusalem and urged a boycott of French multinational giants Veolia and Alstom—companies that held partial shares in the project and were involved in operating the train cars. The official website of the BDS movement bleated out boycott instructions to its troops. Unfortunately, enough people listened, causing Violia and Alstom to lose contracts in Europe. Veolia’s bid for a bus contract from The Hague fell through after a few pro-Palestinian activists objected. An arrangement between Veolia and the North London Waste Authority collapsed after former UN Rapporteur for the Palestinian Territories Richard Falk, who has been a notorious Israel-despiser (and 9/11 truther) for most of his career, spearheaded a PR offensive against the company. In August 2015, the boycotters won, and Veolia sold its last shares in CityPass. Now, it’s possible that Veolia pulled out of Israel for reasons unrelated to the BDS campaign against the light rail—as the company itself insists. Indeed, anti-Israel activists have a talent for taking routine, profit-motivated business transactions and passing them off as watershed BDS achievements. But it’s tough even for optimists to deny that the relentless libel against the light rail at least partially influenced Veolia’s withdrawal. At that point, there were already 375,000 Jews living in eastern Jerusalem, and few of them will move even if a diplomatic settlement is reached. The geopolitical lines around their neighborhoods might change at some point, but they and the physical structures that they live in are there to stay. It’s nothing but punitive cynicism to try to stop Israel from constructing a train line that benefits everyone just to spite eastern Jerusalem’s Jewish residents. All the more so considering that a train line would not be hard to dismantle if the political situation changed. British human rights lawyer Daniel Machover, infamous for trying to have former Israeli Justice Minister Tzipi Livni arrested for war crimes when she visits England, also filed all manner of frivolous petitions trying to punish companies involved with the light rail. These legal challenges went nowhere, but they underscore the strategy of weaponizing international law against Israel. In July 2015, the BBC produced a short film on the light rail, enlisting documentary filmmaker Adam Wishart to narrate. The film’s content wasn’t wrong, but Wishart made no effort to hide his contempt for the light rail, the settlers, and the modern Israeli state. He frequently made wistful references to his Zionist upbringing, suggesting that the state adored by his parents had decayed into a cavity of oppression. 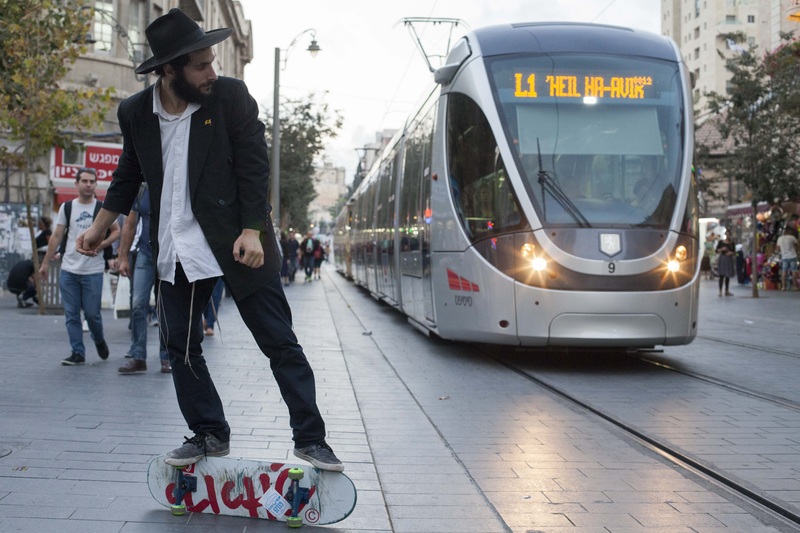 The film framed the light rail as controversial from beginning to end, and was slammed by The Jerusalem Post and Jewish advocacy groups in Britain. Wishart even claimed that the light rail made the neighborhood of Pisgat Ze’ev in eastern Jerusalem “irreversible,” a bizarre claim given that Pisgat Ze’ev has been expanding without the help of a removable train track ever since it was founded in 1982. Over 1.7 million people watched the production when it aired. Attacks on the light rail weren’t only verbal. On October 23, 2014, Abdel Rahman al-Shaludi plowed his car into a light rail stop in Jerusalem, killing a three-month-old girl who happened to have U.S. citizenship. Al-Shaludi was shot and killed trying to flee the scene. Copycat car rammings soon followed, killing several more people before tensions eased. Some might point to these miniature uprisings as proof that Jerusalem’s Palestinians aren’t fond of the light rail. But one Palestinian Hebrew University student summed up the dilemma: “Put yourself in [the rioters’] place. They have nothing and wanted to react to the murder of Abu Khdeir. What would you do? As far as they’re concerned, no one takes care of them,” 23 year-old Ashraf Kheiri told The Times of Israel. Simple honesty is always refreshing. A very small number of Palestinians are attacking light rail stations because they want to vent their frustration in a way that inconveniences Israel. The light rail is a soft target. Recalling her experiences on the light rail back when she was Jerusalem correspondent for The Guardian, Harriet Sherwood remembered being struck that the light rail painted such a rich portrait of Israeli society. Each carriage is a microcosm of Jerusalem’s population, rarely seen in such intimate proximity to each other.…A beautiful girl soldier, long glossy curls bouncing down her khaki-clad back, i-pod plugged into her ears.…An ultra-orthodox man in standard monochrome, curled sidelocks beneath his black hat, thick coat in the October warmth, eyes strictly averted from all around him.…A young Palestinian woman, kohl-rimmed eyes matched by black nail varnish, wearing hijab, tight jeans, and a turquoise top.…A gaggle of Palestinian boys, not quite lads, around 12 to 14, close-cropped hair and football shirts. 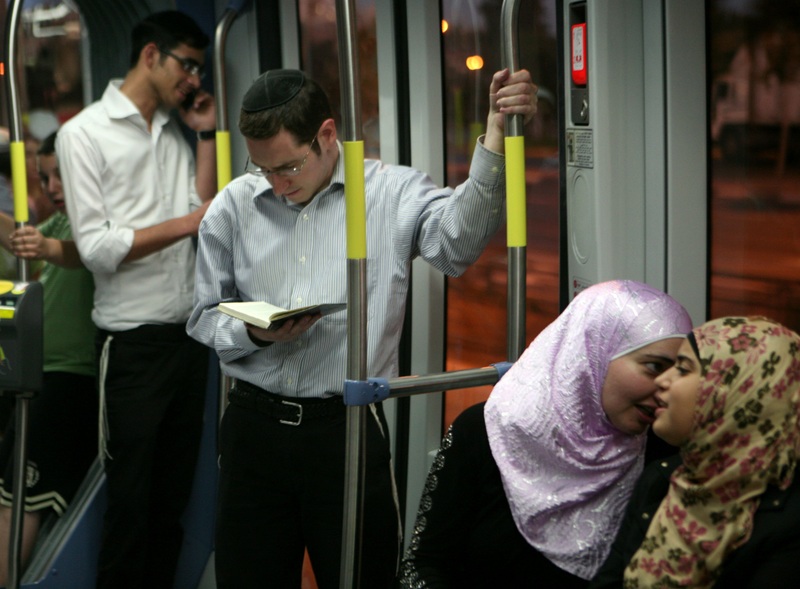 It is clear from such descriptions that the light rail is a rousing success, a means of coexistence between the often bitterly divided communities in Jerusalem. Why then, is opposition to it such an important subject? The answer is the success of the anti-Israel narrative in relation to the light rail. In driving French multinationals out of Israel, European activists discourage foreign investors from working in Israel to begin with. Often, the possibility of negative publicity can be enough to deter a commercial endeavor. More disturbing is how these activists succeeded in persuading the foreign media to adopt the narrative of a “controversial” light rail violating international law. It diminishes Israel’s status as a legitimate nation if it can’t so much as build public infrastructure without international interference. At the same time, the light rail controversy is a vivid example of the disconnect between Palestinians and the Western advocates who supposedly want to help them. By attacking enterprises that benefit both Israelis and Palestinians, BDS evangelizers show that they’ll always opt to cause Israel pain even at the cost of Palestinian suffering that doesn’t bring them any closer to a state. There are plenty of ways to weaken Israel without dragging Palestinians down too, but pro-Palestinian agitators often seem to prefer attacking examples of Israelis and Palestinians getting along, because symbols of coexistence depress enthusiasm for ganging up on the Jewish state. The light rail isn’t the only instance of this. Last year, the Israeli soft drink manufacturer SodaStream was forced to move its factory in the West Bank and lay off its Palestinian employees, nearly all of whom have praised their positive work conditions and asking that the company not be attacked. The light rail still stands and does its job each day. In fact, last month, the Jerusalem municipality approved the addition of two new lines to the light rail to accommodate another 450,000 rides each day. 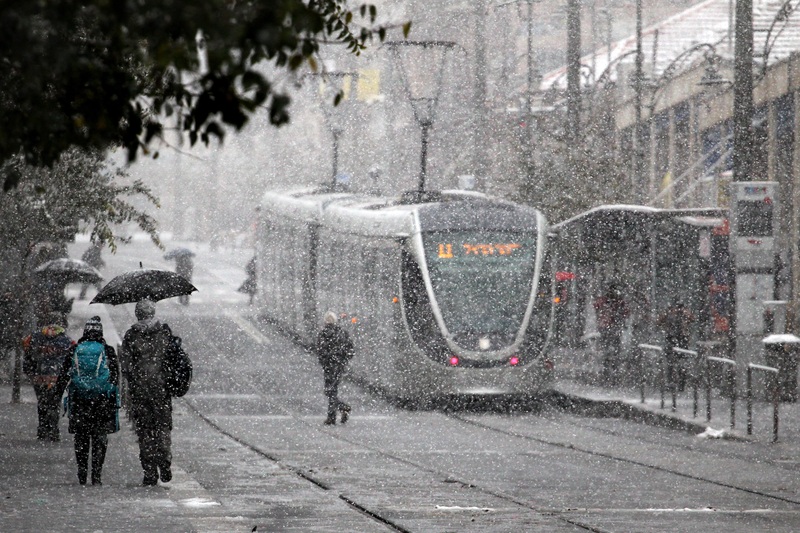 “Jerusalem deserves a light rail system like that in Europe,” said Transportation Minister Yisrael Katz. It does indeed, but it also deserves for Europe to see it that way. The fact that it was so easy to tag it with a false narrative is important because it shows just how easy it is for anti-Israel forces to create controversy in the West and then wield it against the Jewish state.